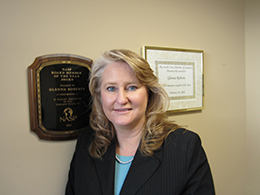 Glenna has spent her entire professional career in the insurance and subrogation industry. She has the unique perspective of having both claims and subrogation experience from the insurer and law firm side of the industry. Early in her legal career Glenna worked at the Hartford Insurance Company overseeing large losses and litigated matters (both auto and property) in Ohio. Glenna's trial preparation skills and attention to detail have resulted in client satisfaction and a history of subrogation recoveries on both property and auto assignments. Her trial accomplishments are impressive, with large recoveries on coverage disputes, construction cases, electrical fires (deviations from the NEC), water suppression systems, bond claims and host of auto cases. Insurers often engage Glenna on complex coverage issues. She has successfully argued subrogtion coverage and insurance policy issues at the appellate level. In 2000, she was co-counsel representing NASP in the Ohio Supreme Court.on the organization's first ever amicus filing. Glenna has the distinction of litigating cases in every county in the state of Ohio. She is the recipient of multiple subrogation industry awards, including the NASP Board Member of the Year Award, and the Business Leader of the Year Award from her community. Glenna has chaired various committees and conferences of NASP, most recently serving as the Conference Chairman for the NASP Litigation Skills Conference on Construction Defects. Glenna has also been a guest speaker at multiple conferences on such topics as ethics, proving damages, bond claims, construction defects and fire losses, changes to Ohio subrogation law and other subrogation issues. Prior to entering private practice, worked at Hartford Insurance Company overseeing large losses and litigated matters.